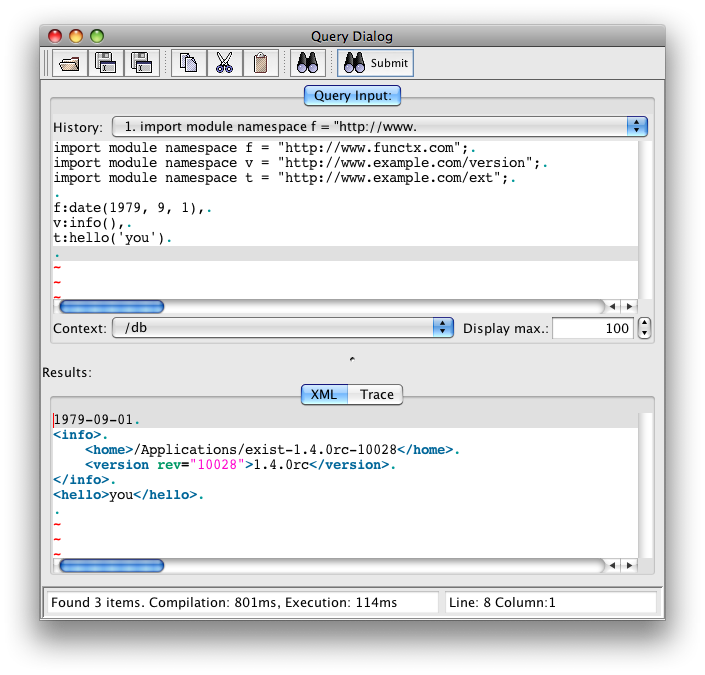 Posted by Florent Georges, on 2009-09-12, in exist, expath and xquery. 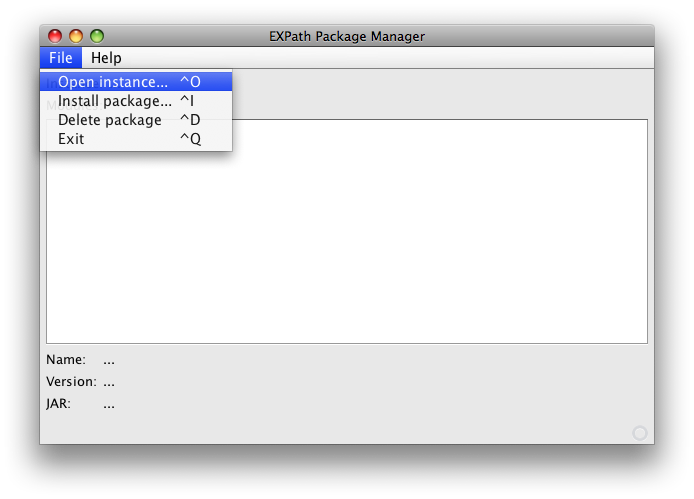 During the past few weeks, I have been working on the Packaging System for EXPath (see also this blog entry for more info.) The concept is quite simple: defining a package format to enable users to install libraries in their processor with just a few clicks, and to enable library authors to provide a single package to be installed on every processors, without the need to document (and maintain) the installation process for each of them. The package manager for eXist is a graphical application (a textual front-end will be provided soon,) and is provided as a single JAR file. Go to the implementations page, or use this following direct link to get the JAR. 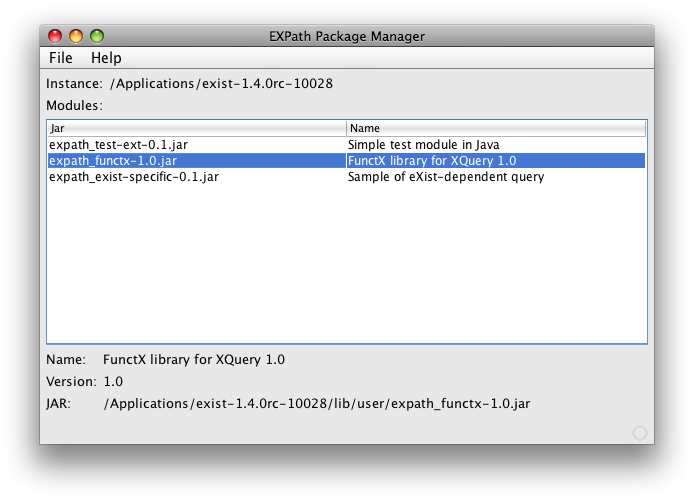 Run it as usual, for instance by double-clicking on it or by executing the command java -jar expath-pkg-exist-0.1.jar. That will launch the package manager window. Once an eXist instance is selected, the manager shows a list of the packages installed in this instance. Using the menu, you can deleting a package previously installed, or install a new one. To install a new package, you have to select it through the file selection dialog. Package files have the *.xar extension. In order to test the system, you can use the following packages. The first one is actually nothing else than Priscilla Walmsley's FunctX for XQuery, that I packaged (just because this is a more interesting and useful example of a library written in standard XQuery than a simple hello world example...) The second one is a simple XQuery module that use eXist extension functions (remember that a XAR is simply a ZIP file, so you can open it and see the actual XQuery file within it.) Technically, it is deployed exactly as a standard XQuery file, but in the package it is flagged as dependent on eXist. And the last one is a simple module written in Java. It provides a simple function that says hello. If you have any comment, idea or criticism, please tell us on the EXPath mailing list. I hope to release the package manager for Saxon quite soon, I will announce it on the list. Posted by Florent Georges, on 2009-09-12T20:11:00, tags: exist, expath and xquery.